Computronics Corporation in Savyon, Israel has created and sold Bible codes programs since 1990. With their latest, they've added exciting new features to improve Bible codes search capabilities, added an advanced gematria engine to enable research in letters as numbers, and added a host of Bible study aids. 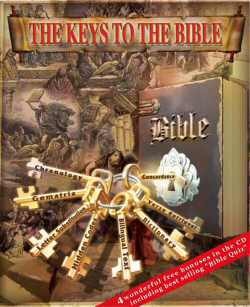 This is the world's #2 ranked codes program, just behind CodeFinder; but with lots of unique and helpful Bible study aids. Available here only as a download (saves money and you get it right away). These advanced features in Keys To The Bible will enable the user to search for their name in the Bible code, and look for past-present-future events. With each step in codes software development, the software makes the whole process of Bible codes research faster and easier. Windows 98 to XP, Windows Vista and Windows 7. Matrix Manipulation: Turn the matrix vertical or horizontal, and reverse it for mirror image. Statistics: Gives an automatic correct statistical calculation of terms in the matrix, while providing some change capability for people who understand stats. Uniquely, the program allows the user to draw a box in the matrix containing the matrix terms and select "stats" to display the statistical information and matrix odds. It will be eye-opening for users to see the correct odds. Further below is a graphic of the stats for a small matrix. Matrix Report: A new 4-page automatically generated report shows parameters, findings, matrix information, and statistics for the Bible codes matrix you develop. Print it or save it, or export it as a MS Word document. Gematria Engine: Has 7 different accepted letter-number methods plus an 8th method which is a unique user specified value system. The 5 bilingual dictionaries tie into the Gematria engine as does the date database. Gematria is a method of exegesis (critical explanation or analysis of a text) used since the time of the Second Temple to derive insights into the sacred writings, to obtain interpretations of the text, or to illustrate a secular matter. Verse Retrieval: Allows verse retrieval in the text of the Bible in 8 different ways. Bible Chronology: Shows dates with events from the time of the birth of Abraham in 1950 BC down through 110 AD. People who read the Bible will find this feature extremely helpful in learning what year an event took place. Biblical Festivals: Explains the 7 Jewish Feast days/periods, the Sabbath, New Moon, Purim, and Hanukkah with explanations and scriptures which show aspects of these Festivals. 613 Commandments of Maimonides: Shows all 613 commandments laid out by Maimonides in his book, Sefer HaMitzvot. They are divided into the 265 Mandatory commandments and 348 Prohibitions. Each one is linked so that with a click you go to the commandment in the Bible text and can see it in Hebrew and English translation. There is also a separate "bio" of Rambam (Maimonides) in English. Rashi Commentary: A verse-by-verse commentary on the Torah by Rashi, who is considered the greatest of the medieval sages. You can look at the English Rashi commentary or the Hebrew Rashi Commentary. Additionally, there is a separate "bio" on Rashi in English. Festival Concordance: Added to the already outstanding full Hebrew and English concordances is a new Festival concordance. Select the festival you want to explore and it lists each verse in the Tanakh touching on the subject. You can click on the link to go to it onscreen in the Bible text window. Torah Portion of the Week: Click on it to go to the Torah portion for the week used by all Jews all over the world. Manual: 100-page printable manual explaining the software and Bible codes (PDF on Download version). Below is a graphic showing the matrix terms, Stats boundary box, and the Statistics window for the "Bin Laden" matrix from Bible Codes II by Michael Drosnin, page 194. Note: I did add 4 aditional terms that were not in Mr. Drosnin's matrix in his book. The odds of the matrix are now1 chance in 1732 billion. On the above matrix, I found and added the terms: "he will uproot the USA", "dead/corpse is deceitfulness", and "a volley of anger flew" in preparing it to use for this webpage. The main term is vertical in red, "Bin Laden". The Stats window below automatically calculates the Total R-value, Total E (expected occurrences), and Matrix Odds for the matrix. Now, the average person with no knowledge of statistics can have accurate statistics calculated automatically for them with the capabilities in the Keys to the Bible program. While the odds are impressive, if one calculates the odds of Mr. Drosnin's original matrix as shown in his book, the Total R-Value is 0.022 or about 1 chance in 2 of it occurring by chance (extremely low). This occurs because all his longer terms were straight out of the surface text (which we value at 0.00).